Last Hour Strength – Welcome Back! We’ve been discussing the market’s recent tendency to rally in the last hour of trading numerous times in the last few weeks. To summarize, in the 21 trading days since Christmas, the S&P 500 has been up in the last hour of trading 15 times! With a slight decline in the last hour of trading last Friday, the 20-day rolling total of positive last hours as of Thursday’s close was even stronger as the S&P 500 was up in the final hour of trading 75% of the time. Strength in the last hour of trading is generally considered a bullish trend as it signals that investors aren’t worried about the overnight risk of being long equities while the market is closed. The fact that we have seen such consistent strength in the last hour has been a change of pace for the market based on recent trends. From a longer-term perspective, though, such strength is not uncommon. The chart below shows the rolling 20-day total of the number of days where the S&P 500 saw positive returns in the last hour of trading. Before the most recent occurrence, the last time the percentage of days with positive last hours reached 75% or more over a 20-trading period was in October 2017. That’s a pretty long gap without any occurrences, but when you look back over time, this long of a gap was more of the exception than the rule. 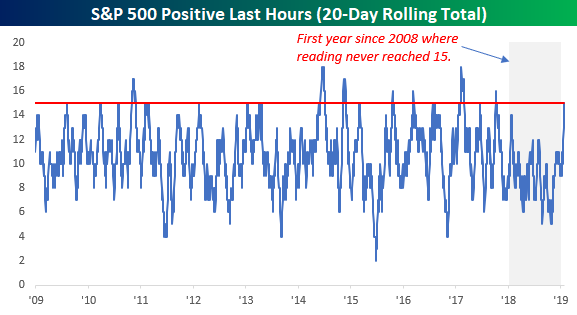 In fact, before 2018 the last time that the 20-day rolling total of positive last hours never reached 15 in a calendar year was in 2008. Hope everyone has a great trading day ahead today! 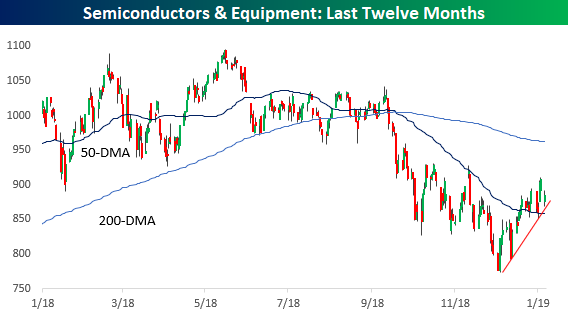 Yesterday’s earnings warning from Nvidia (NVDA) caught the overall semiconductor group by surprise. After a nice rally off the lows in late December, the group had really stabilized in recent weeks, but the warning and NVDA’s subsequent 15%+ decline at the open threatened the fragile recovery. 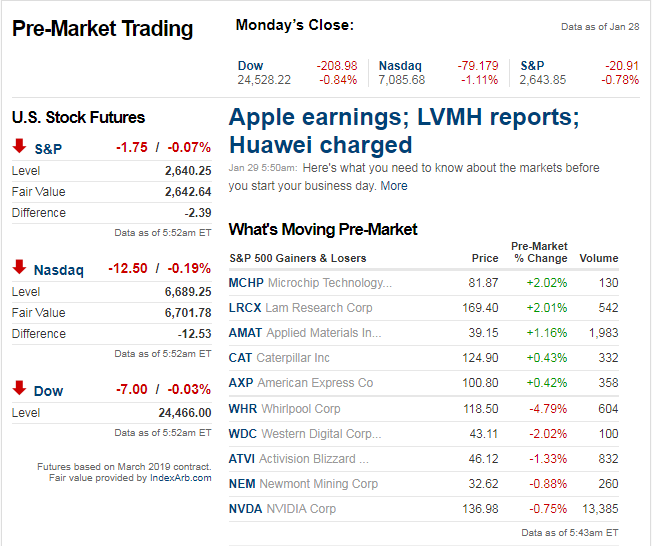 While the group finished down on the day, things didn’t get much worse after the opening bell. As shown in the chart below, while the group opened weaker, it held support at the short-term uptrend off the December lows and finished the day up nearly 2% from its early lows. The same can be said for just about every stock in the semiconductor group. 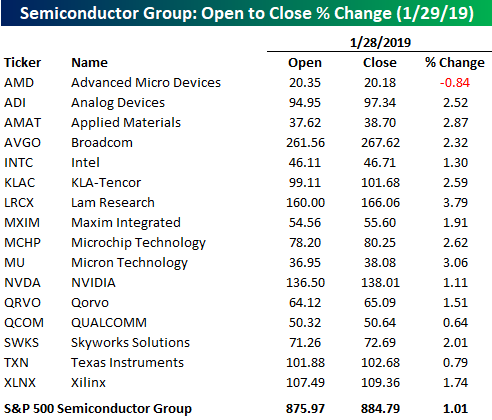 The table below shows the open to close percentage change for each of the sixteen stocks in the S&P 500 Semiconductor and Semiconductor Equipment Index. Of the 16 stocks listed, the only one that finished the day lower than it opened was AMD, and the other 15 stocks in the group actually rallied slightly more than 2% from their prices at the opening bell. WHR with quite a turnaround from last night's ER drop. WHR now up to a gap resistance. So much for guiding down last night. T0rm3nted and Steven_Burt like this. 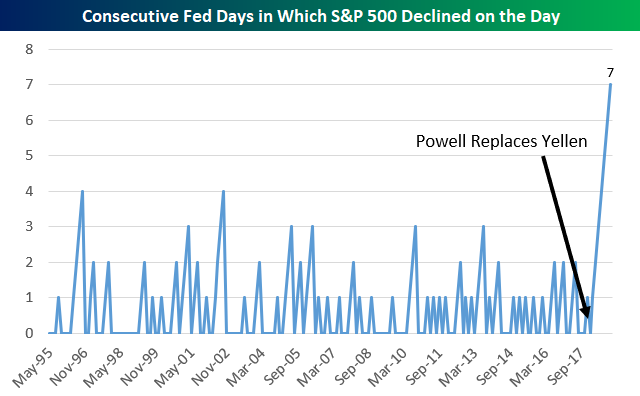 Interesting, the current streak of SPX down days on "FOMC day" is the longest on record, and by a mile. Let's see if we break that losing streak with an up day tomorrow (or not ). It did nice, but still way below 200 ma. Hope everyone has a nice trading day ahead today! Big earnings from Apple (AAPL) last night after the close and Boeing (BA) this morning have pushed the Dow futures sharply higher. While the gains aren’t as large in the S&P 500 and Nasdaq, they are also both pointing in the right direction for bulls. Now, all we have to do is get through this afternoon’s rate decision from the FOMC and the subsequent press conference. The number one wish from the bulls for Fed Chair Powell? Stick to the script and end the record streak of declines on FOMC days since he became the Chair! just a quick reminder that we have the fomc announcement at 2pm eastern today, followed by powell's presser. Tupperware taking a big hit -27%. Guess a lot of other people are re-purposing margarine containers instead of buying Tupperware.